BOSTON, Mass. – In a season filled with so many firsts, it was only fitting for Jim Crutchfield to add one more to his resume on Monday, as the Nova Southeastern head coach was announced as the recipient of the 2019 Jack Bennett award, which represents winning with integrity. 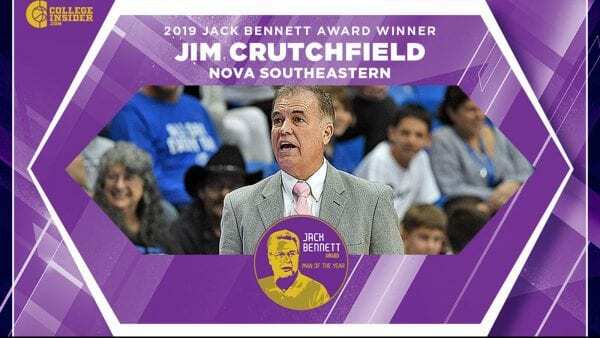 In just his second year in charge, Crutchfield guided the Sharks to uncharted territory, finishing 2018-19 with a record-setting 29-4 campaign that included a trip to the Elite Eight. The 29 victories not only set a new program best, but blew the previous single-season mark of 22 out of the water, Nova Southeastern climbed as high as No. 3 in the National Association of Basketball Coaches (NABC) rankings before locking up both the Sunshine State Conference regular season title and NCAA South Region Championship, also program firsts. 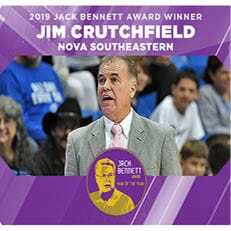 Crutchfield earned his 400th career win in a 98-76 rout of Palm Beach Atlantic on Senior Night in late February, and has since run his career overall record to a remarkable 405-75 (.844). The Jack Bennett award is named in honor of the former head coach at the University of Wisconsin-Stevens Point. Bennett won five Wisconsin Intercollegiate Athletic Conference titles, made five NCAA tournament appearances and won two national championships. He’s the program’s all-time winningest coach with a 200-56 record. In 34 seasons as head coach he compiled a record of 480-175.